Introduction of Goods and Services Tax (GST) is not merely a tax reform. It’s a complete overhaul of the pre-existing indirect tax regime. This is because it makes way for a simpler indirect tax system and an enhanced compliance. Simplicity in GST regime stems from integration of a host of indirect taxes levied previously. And the enhanced compliance results from digitization brought about in implementing GST. Digitization involves shifting each aspect of procedural compliance online. Each aspect of compliance has been duly automated including application for registration, return filing, or refund processing. And, to further aid effective implementation of the GST system, penal provisions for law offenders have been laid down. These penalties under GST Penalty are levied to prevent evasion of tax and to punish those who breach the law. The offences drawing fiscal penalties involve proceedings that are quasi-judicial in nature. Such proceedings are carried out by the departmental officers. Offences attracting prosecution, on the other hand, are judicial in nature. Such proceedings are dealt by Courts and may lead to imprisonment or fine. Furthermore, the offences attracting fiscal penalty can be further bifurcated into Revenue Issues and Procedural Issues. Revenue issues involve demand and recovery of amount of tax, interest, penalty or fine due to government. The procedural issues, on the other hand, include contravention of prescribed procedures or modalities not involving revenue. 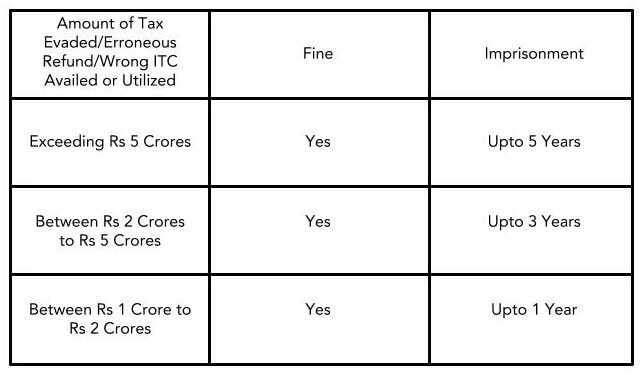 Hence, to help you understand the penalties attached with various offences, here is a complete guide on GST Penalty. And, to further aid effective implementation of the GST system, penal provisions for law offenders have been laid down. These penalties are levied to prevent evasion of tax and to punish those who breach the law. Section 122 of the CGST Act, 2017, lays down certain offences along with the fiscal penalties. This section is divided into 3 sub-sections, each attracting different penalties. Issue invoice or bill of supply without making a supply in violation of the provisions of the Act or Rules. Furnish invoice or document using the registration number of another registered person. Collect tax but fail to deposit it to the government. Provided such a tax is not deposited for a period exceeding 3 months from due date. Suppress your turnover leading to evasion of tax. Collect tax in contravention of law but fail to deposit it to the government. Provided such a tax is not deposited for a period exceeding 3 months from due date. Deduct tax or deduct appropriate tax as per section 51. Section 51 is applicable for certain specific persons. It requires such persons to deduct tax at the rate of 1 per cent out of the payment to the supplier. Provided the value of supply under the contract exceeds Rs 2.50 Lakhs. Collect tax or collect appropriate tax as per section 52. Section 52 is applicable for electronic commerce operators. Such operators are required to collect tax from the supplier at the time of payment. The tax collected should be at the rate of 1 per cent. Either fail to furnish information or documents called for by an officer. Or furnish false information or documents during any proceedings. Hence, if you are such a supplier who makes a supply for any of the following two reasons, the penalties attached would be levied. Following offences relate to section 122 (3). These offences deal with the situations where you are not directly involved in tax evasion. Instead, you aid or abet or may be a party to such an evasion. Furthermore, it also includes cases where you do not attend summons or produce documents. Acquiring or concerning with goods which are liable to confiscation. It includes transporting, removing, depositing, keeping, concealing, supplying, purchasing or other ways of dealing with goods. Failing to issue an invoice in accordance with the provisions of the Act or Rules. Or failing to account for an invoice in books of accounts. Receiving or concerning with the supply of services which are in contravention of the provision of the Act or Rules. It also includes any other manner of dealing with such a supply of services. Failing to appear before the officer of the Central Tax. Provided you are issued with summon for appearance in an inquiry. And you are supposed to give evidence or produce any document in such an inquiry. Penalty: If you as an offender commit any of the above offences, then you shall be liable to pay a penalty which may extend to Rs 25,000. Under the CGST Act, 2017, section 123 deals with circumstances where you fail to file an Information Return under section 150. Section 150 lays down cases where you are obligated to furnish an Information Return. If you fail to furnish an Information Return in such cases within a stipulated period, it calls for a penalty. The stipulated period to file Information Return is 30 days from the date of issue of show cause notice. Penalty: If you fail to file IR within stipulated time, you shall be liable to a penalty of Rs 100 each day for which the failure continues. Such a penalty cannot exceed Rs 5,000. Section 124 of the CGST Act, 2017, deals with penalty levied in circumstances where you fail to furnish information under section 151. According to section 151, a Commissioner has the power to collect statistics concerning any matter dealt with under the Act. He may issue a notice asking you to furnish information or returns in a prescribed format. Such information relates to the matters for which statistics are to be collected. Penalty: If you fail to furnish such information, you shall be liable to a fine of up to Rs 10,000. But where the offence is continuing, a further fine of Rs 100 is levied each day for which the failure continues. However, such a penalty cannot exceed Rs 25,000. Provided, there is no penalty separately prescribed for such an offence under the Act. Penalty: The penalty imposable in such a case is up to Rs 25,000. Section 132 of the CGST Act, 2017 describes cases of tax evasion and the penal actions applicable on specific events. This section provides for cases where your offences lead to prosecution and accordingly a punishment is initiated on you. The term prosecution means conducting legal proceedings against an offender before a legal tribunal. And the punishment for such an offence involves either imprisonment or fine or both. Supplying goods or services or both without the cover of invoice. Provided it is done with the intention of evading tax. Issuing any invoice or bill without actual supply of goods or services or both. Provided such an act leads to wrongful input tax credit or refund of tax. Availing ITC using invoice referred to in point (ii) above. Collecting taxes without any payment to the government for a period exceeding 3 months from due date. Evading tax, availing credit or obtaining refund with the intent of fraud. Where such offence is not covered in clause (i) to (iv) above. Falsifying financial records or producing false records/ accounts/ documents/ information. Provided it is done with the intention of evading tax. Obstructing or preventing any officer from doing his duties under the act. Acquiring or transporting or in any manner dealing with goods liable for confiscation under this Act. Receiving or dealing with supply of services which are in contravention of any provisions of this law. Tampering or destroying any material evidence or documents. Failing to supply information which a person is required to supply under this law. Or supplying false information. Attempting or abetting the commission of any of the offences mentioned above. Now, this section enables commencement of prosecution proceedings against the offenders. It also lists the period of imprisonment and quantum of fine for all such prosecution offences. Such a punishment varies depending on the amount of tax evaded or seriousness of the offence as listed below. C. This part deals with repetitive offences. There are cases where you are convicted of repetitive offences. And such offences without any specific/special reason are to be recorded in the judgment of the Court. Such offences will entail an imprisonment term of not less than 6 months. But such imprisonment could extend to 5 years plus a fine. (ii) Instances covered by (a) to (d) in Para A.
E. Every prosecution proceeding initiated under this section requires prior sanction of the Commissioner.